Hello Kitty Foodie Meets Chococat and Pompompurin! The collaboration between Sanrio and Plan Check Restaurant and Bar for Chococat and Pompompurin’s 20th anniversary is well underway. Right before opening up the special menu offering to the public however; Sanrio had a special party and this Hello Kitty Foodie was so lucky to get to be a part of it. Upon arriving at Plan Check Downtown, I was already in awe and amazement at seeing all the Chococat and Pompompurin love all around the restaurant. Pompompurin was peeking out the window in pure excitement ;). Chococat similarly was eagerly awaiting guests. The two cuties were super excited for the Sanrio party and so was I ;). Walking in my excitement was at its peak because there was even more cuteness overload! Our favorite black cat and golden retriever was right up front to welcome guests! Right next to our favorite Sanrio pals, was a wonderful assortment of food. Every delicious item from the special Pompompurin and Chococat menu was there. The night started off with trying the mac and cheese. This mac and cheese turned out to be one of my favorite items from the Pompompurin and Chococat set. The Americanized Dashi Cheese along with the Parmesan Reggiano brought such a creamy and cheesy texture to this. I also liked the addition of bread crumbs that gave a nice toasted texture to the dish. The next item I got to try was the Togarashi Chips. The sliced yukon gold potato chips were perfectly crisp. The Togarashi seasoning gave a unique flavor. I liked the mac and cheese and Togarashi chips. It was however the Pompompurin grilled sausage sandwich that I was most eager to try. When I did finally get around to slicing the super cute sandwich and trying it, I was delighted with the mixture of flavors the sandwich offered. The house blended sausage together with the Kimchi slaw and kewpie cilantro mayonnaise was amazing. The sausage was tender and moist. The Kimchi slaw and kewpie cilantro mayonnaise brought a subtle sweetness that enhanced the sausage. It was so savory! After all the savory eats, it was time for the sweets! I first tried the vanilla cream soda with whipped cream. Topped with a kawaii image of Pompompurin this was the perfect pair to the Pompompurin sandwich. The vanilla cream soda was thick and almost like a milkshake. It was one sweet delight. I ended my meal with the sweetest and cutest treat of all and that was the Chococat cookie. This sugar cookie definitely makes it on the top of my list of the cutest cookies I have ever seen. Not only was it sweet looking but it was sweet tasting as well. Aww Chococat this Hello Kitty Foodie loves you. The fun didn’t end there however because all of us guests got the best surprise ever when Chococat and Pompompurin made an appearance! Our favorite Sanrio pals are not only cute but super friendly as well. Pompompurin even showed a couple of dance moves ;). It was truly one amazing night. I will surely wear my exclusive Plan Check x Pompompurin x Chococat hat with a smile. Thank you to Sanrio and Plan Check Kitchen and Bar for all the fun and memories. Hello Pompompurin and Chococat @ Plan Check Kitchen and Bar! It’s time to once again and say hello to Plan Check Kitchen and Bar! 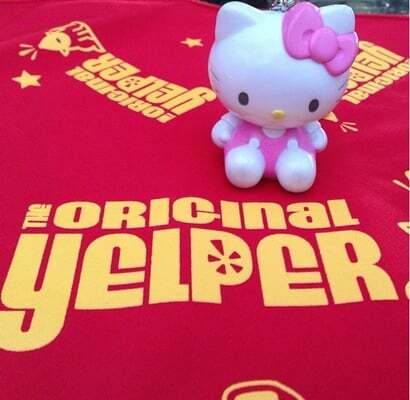 Once again the popular LA restaurant is partnering with Sanrio! After Hello Kitty’s Hungry Hunt in October of 2014 and their Gudetama promo in October of 2015; Plan Check and Sanrio are now coming together to feature Pompompurin and Chococat. It’s the two kawaii characters 20th anniversary this year! Who doesn’t love the cutie (and sleepy) golden retriever Pompompurin and Chococat, the boy cat with a chocolate nose ;)? Pompompurin and Chococat are celebrating their anniversary with all of us foodies as they party at each of the Plan Check Kitchen and Bar locations in the Fairfax, Sawtelle and Downtown LA. To help celebrate their cuteness, Plan Check Kitchen and Bar has a special menu featuring Pompompurin and Chococat inspired dishes! As a starter they have a Mac & Cheese dish with Americanized dashi cheese, bread crumbs, and Parmigiano Reggiano. They also have crispy Togarashi Potato Chips as a an appetizer. Togarasi is a peppery Japanese condiment made of assortment of dried chil peppers. Plan Check has them sprinkled over some crispy potato chips for this event! The main course consists of a Pompompurin Grilled Sausage Sandwich. This sandwich featuring the face of Pompompurin is almost too cute to eat! It sure has a lot of deliciousness packed in with house blended sausage, kimchi slaw, and kewpie cilantro. Chococat maybe a scatter brain at times but he is one sweet cat! Plan Check celebrates his sweetness with a cookie dedicated to him! The kawaii cookie will be served with vanilla ice cream. Last but not least a Vanilla Cream Soda featuring the equally sweet Pompompurin ith whipped cream will be served! This multi-course Plan Check Pompompurin and Chococat menu will be available for $39 starting Friday, June 10 and running through Sunday, July 10! All guests ordering this special meal will get a limited edition co-branded cap featuring our favorite Sanrio golden retriever Pompompurin and black cat Chococat!